We got the New York Knicks' side of the decision not to match the offer sheet that Jeremy Lin signed with the Houston Rockets on Wednesday morning, thanks to tabloid beat man Frank Isola of the New York Daily News. Isola reported that the Knicks declined to bring back the restricted free-agent point guard, in part, because owner James Dolan felt "betrayed" and "deceived" by Lin agreeing to a restructured three-year, $25.1 million deal that would have been much more financially onerous for New York to equal than the four-year, $28.8 million sheet initially floated by the Rockets, which the Knicks said they would match. Whether or not you think there's any validity to the owner's feelings — and, y'know, I don't — that's the spin coming out of Madison Square Garden. We didn't bring the kid back because the kid's a no-good traitor. Well, we got the no-good traitor's side of the story on Wednesday afternoon, thanks to Pablo S. Torre of Sports Illustrated. Shortly after the Knicks announced they wouldn't match and Lin officially became a Rocket, Torre spoke with the 23-year-old point guard about where he is, how he got there and where he'd have liked to be: "Honestly, I preferred New York." Torre's exclusive interview with Lin — whom he profiled in a pair of late February pieces that made Lin one of just three NBA players to appear on back-to-back SI covers — includes some amazing details about Lin's courtship (or lack thereof) by the Knicks. While it's hard to pick which is the most revelatory, the fact that New York's brass had "spoken to [Lin] and his representatives only once this month" before a brief phone call from general manager Glen Grunwald late Tuesday night to confirm the team's decision and wish him luck seems like a pretty instructive bit of information, especially considering the Knicks had publicly represented that Lin's return was all but assured, with one source suggesting the team would match any offer "up to $1 billion" and head coach Mike Woodson saying Lin was his starting point guard. It also lays plain Lin's situation at the time that Houston tendered its reconfigured offer sheet: "By this point, Lin had no real idea what the Knicks would do. But there also wasn't much choice: There was all of one offer sheet in front of him to consider." It just so happened it was the one that included a so-called "poison pill" offer that would leave the Knicks in an even hotter circle of luxury-tax hell in 2014-15 than was previously reserved for them thanks to their own machinations. So he signed it, which seems less like deception or betrayal than doing what literally anyone else would do in the same situation. Lin also flatly, if indirectly, rebuts bombs lobbed by the likes of ESPN's Stephen A. Smith, who claimed the guard has "been all about the money since the day he burst onto Broadway," and Isola, who had called Lin out on the carpet for choosing not to rush back from knee surgery for Game 5 of the Knicks' first-round playoff series against the Miami Heat because he estimated himself at "85 percent." "Every single vet on our team that has been in the league longer than five years pulled me aside and told me that I shouldn't play," Lin says. "And I had arguments with them about why I should." Dolan — who didn't talk to Lin often but had generally been "really nice to me" — wound up expressing support. 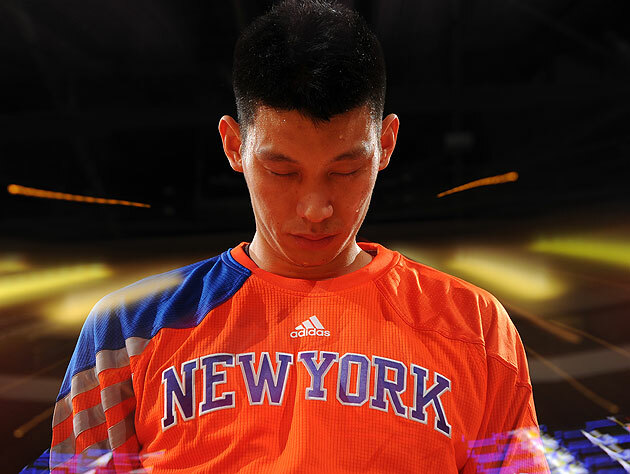 "I have plans for you in the future," Lin recalls the owner saying. "This is a long-term investment. Don't rush back." "I love the New York fans to death," Lin says. "That's the biggest reason why I wanted to return to New York. The way they embraced me, the way they supported us this past season, was better than anything I've ever seen or experienced. I'll go to my grave saying that. What New York did for me was unbelievable. I wanted to play in front of those fans for the rest of my career." It'll be fascinating to see what Dolan, CAA or whomever else have up their sleeves if they want to paint that guy as a villain. I'm sure someone in the Garden's Photoshopping Lin with a coat made out of puppies as we speak. • Y! TV: Can anyone break 'The Daily Show's' Emmy streak?